I have been dressing my 4 year old granddaughter's American Girl doll in Maulfrid's beautiful doll clothes. Her little sister now started to ask for a dolly and clothes too, so I got a Bitty Baby for her and for me and got started. 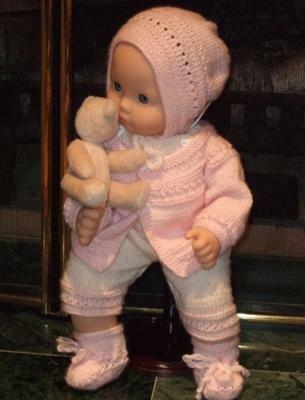 This is my first baby doll outfit and it was just so much fun to knit. I love the cozy way she looks in her outfit and can't wait to see little sister's eyes when she sees her first Maalfrid doll outfit. 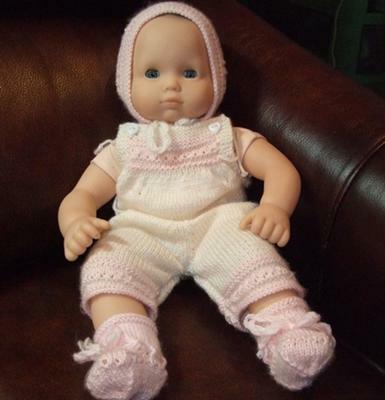 I am so excited to make more Bitty Baby doll clothes using the premie baby outfits on this site. Thank you for so many lovely patterns that we never run out of ideas and inspirations. Thank you also for you help whenever I get stuck. My grand daughter also has Bitty Baby and,I have found,that if you purchase the preemie size baby clothes they will also fit Bitty Baby. I love your knitting for dolls. I don't have to alter the pattern at all for Bitty Baby. This pattern was from the premature baby collection and fit her perfectly as you can see. Bitty Baby is 15 inches tall. Thank you very much for your lovely comments. I was wondering if you altered the pattern for size? 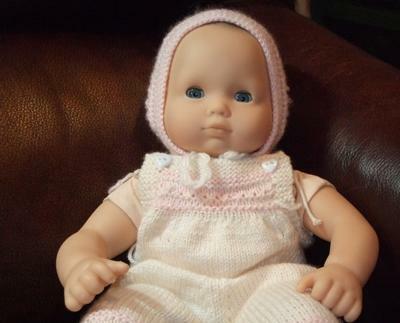 I want to make a layette for my granddaughter's bitty baby and wasn't sure if it would fit? Lovely knitted set you done. May I ask you which yarn did you used to knit it? I live close to Toronto, and here I have not find the yarn that is been suggested for these patterns. Thank you. 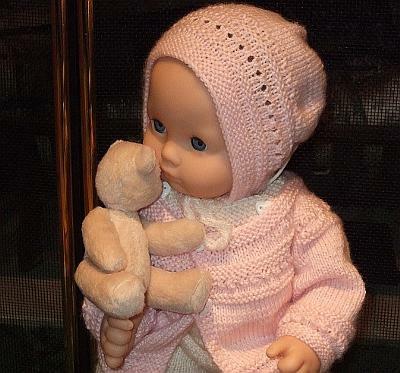 You made a beautiful layette set for this doll. I enjoyed your pictures every step of the way. So nice to see the doll dressed in her new clothes. She is very cute and you have done an excellent job Rona. I am sure your granddaughters love to get clothes for their dolls! Thank you for sharing and I am glad I have been able to help you. Look forward to see more of your knitting work in future. Good luck!